Buses pick up at Seminary Drive every 30 minutes, at approximately :05 and :35 minutes after the hour, starting at 4:05 AM until 11:05 PM. The trip to SFO usually takes a little less than an hour, but may take longer depending on traffic conditions. Going to SFO, the bus stops at the freeway bus pad on southbound Hwy 101, at the Seminary Drive exit. Returning from SFO, the bus drops on the northbound side of Hwy 101, across from the pickup location. 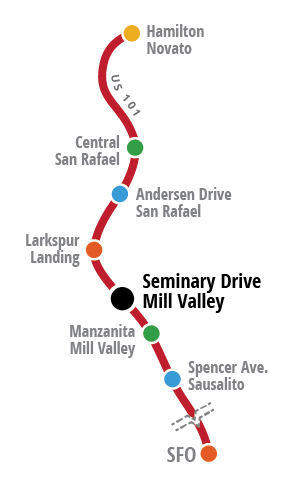 There is no long term parking available for Marin Airporter customers at Seminary Drive. Street parking subject to posted limits.